“Want more? We thought so, join now and take full advantage of our HUGE resource library of over one hundred “Ask Alan” videos with more added EVERY month! 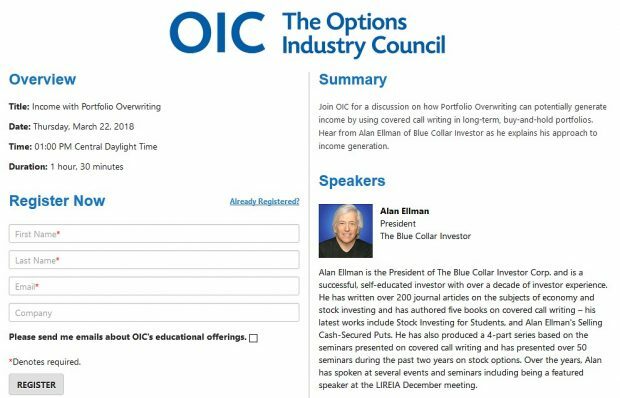 Get direct accesses to Alan and have your questions answered. The complete library of Ask Alan videos is located in our premium member site. If you want more “Ask Alan” videos, you can view the archive. To enter your questions to “Ask Alan”, fill out the form on the contact page. Be sure to begin your message with “ASK ALAN”. I purchased your covered call encyclopedia book a couple weeks ago and love it. If you can’t find what your looking for in there your probally not going to find it anywhere. I have been trying to apply your strategies ( mainly your exit strategies to weekly covered call writing ) keeping in mind that it is a weekly option and not a monthly. So far I am doing very well with it. My question to you is do you do any weekly covered call writing or have any literture on the subject? My main reason for liking weekly trades is the 52 pay days rather than 12 per year. Thank you very much and have a great day. The BCI team is working on a formula for employing weeklys into our conservative approach to cc writing. We want to cover all bases before “allowing” these new products into our proven methodology. I firmly believe that there IS a place for weeklys and cc writing and will share our methodology in the near future. Thanks for the suggestion. I have written six books in eight years and plan a bit of a break before a seventh. I’ve had other suggestions and will give all due consideration. I appreciate your valuable participationin our BCI community.